Natural gas, an abundant natural energy and chemical resource, is underutilized. Its inherent high energy content is compromised by its volatility. Storage and transportation problems abound for liquified natural gas. Several of the drawbacks of the utilization of natural gas, particularly its high volatility, could be offset by development of an economical and efficient process for coupling and/or further homologation of its principal component, methane. Alternatively, other conversion strategies such as partial oxidation to methanol and syngas, to oxygenates or conversion to such products via the intermediacy of chlorides should also be considered. Given the energy-intensive regimes necessary for the likely activation of methane, it was inevitable that researchers would tum to the use of heterogeneous catalysts. Heterogeneous catalysis is now a relatively mature discipline with numerous and diverse reactions being explored alongside informative studies on surface characterization, mechanism, and theory. Relationships to important related areas such as homogeneous catalysis, organometallic chemistry, and inorganic chemistry have become firmly established within this discipline. 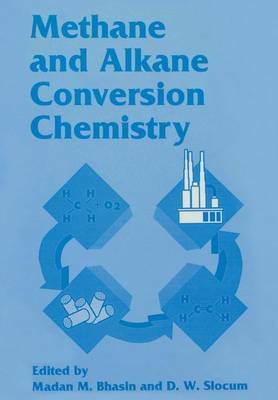 The field of methane and alkane activation is now over ten years old. The first decade of investigation produced results plagued by low yields and low-moderate conversions with well-articulated mechanistic limitations. As we begin the second decade of inquiry, novel strategies have brought increasing yields and conversions to such products as ethane, ethylene, methanol, and formaldehyde. These new approaches utilize separation of products via membranes or adsorbents. Moreover, additional mechanistic insight has been forthcoming from theoretical and computational examination as well as experimental investigation.